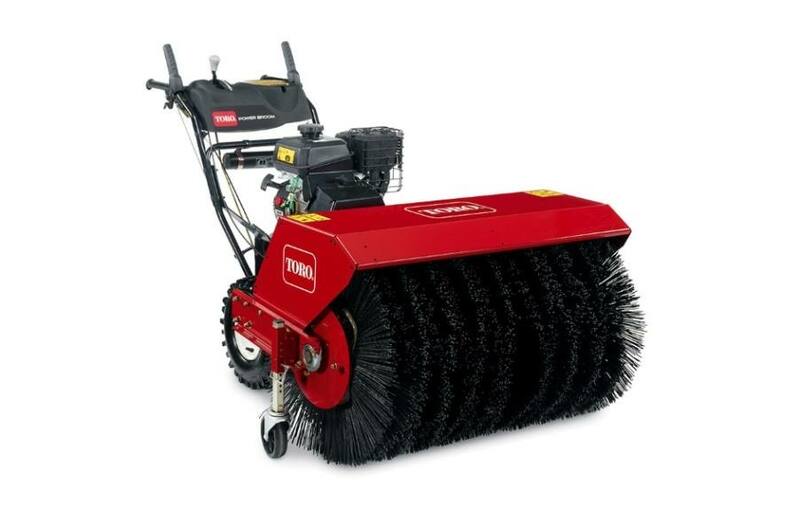 The Toro Power Broom is a multi-purpose broom with applications for every season. From brushing away snow to clearing debris and dethatching grass, this broom has landscape contractors needs covered year-round. 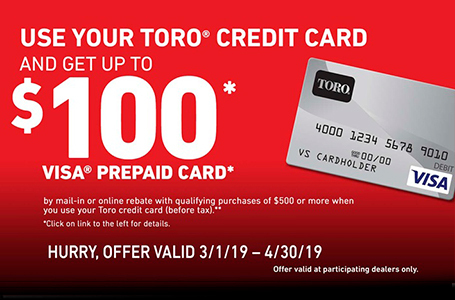 Its innovative features allow for the high performance and ease of use that you expect from Toro. Integrated Tie-Down Points: Four integrated tie-down points are built right into the frame of the machine so you can secure quickly and transport safely. Power Steering: Turn on a dime! Wheels can be disengaged independently or simultaneously with trigger controls - making turning, reversing and steering easy for anyone. Variable Speed: With 6 forward and 2 reverse speeds and shift-on-the-fly transmission, our variable speed technology allows you to walk at your own pace with no effort. Independent Control Levers: Control levers for broom engagement and ground drive allows you to disengage and engage the broom at any point while you're driving. 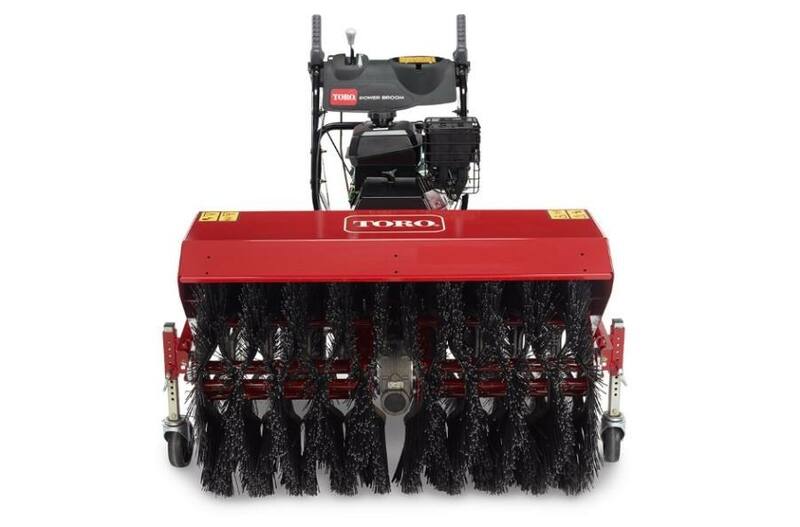 Pin Height of Brush System: Eliminate brush wear and surface damage. Our unique pin height-of-brush system allows for precision height adjustment up to 1/8" increments. No more tricky screws and time wasted leveling. Broom Angle Adjustment: An easy to use thumb latch lets you change the angle of your broom by 20 degrees in either direction, allowing you to sweep the snow away from your path and where you want it. 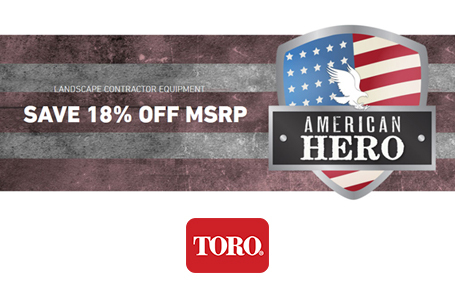 Durable Construction: Toro's Power Broom is built to last. Its robust frame is specially constructed for ultimate strength and durability. The reinforced handle bars and heavy-duty gearbox stand up to years of the toughest conditions. Kohler 208cc Command Pro Multi Season Engine: This multi-season engine features a four-stage cyclonic air filtration system that keeps debris out of the engine. The air filter cover can easily rotate 180 degrees to recycle heat when used in the winter. No engine handles through the seasons like this one. Drive Tires: 15" x 5"